It’s that time again! 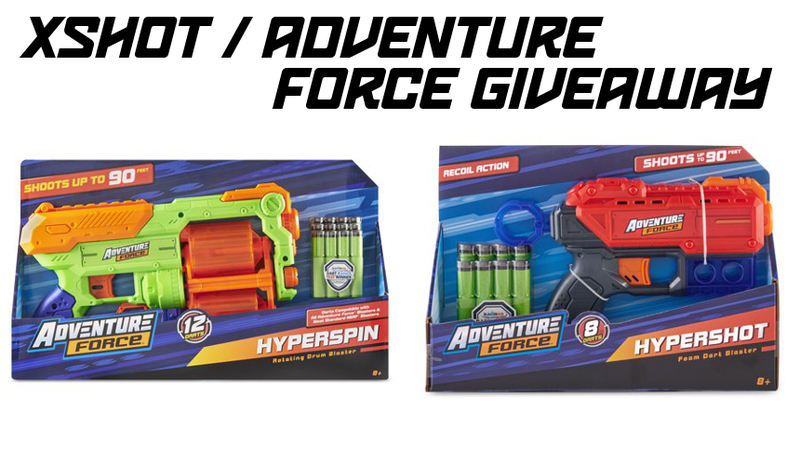 In the name of shameless self promotion and handing out cool stuff, we have two quality blasters to giveaway – the Adventure Force Hypershot and Hyperspin. You may recognize them as the Xshot Recoil/Pulse/Kickback and the Xshot Xcess, just with differently-colored plastic. One person will be receiving both of them! Entry is simple: Go to the contest post on our Facebook page, comment on the post, and annoy a friend by tagging them in it! The winner will be chosen at random from the main-level comments (as opposed to replies to comments). Winners are sadly limited to the United States, as this is still a limited operation with limited funds. Contest will end this Saturday (01/26/19) at 8pm EST, with a winner announced shortly after, both on here and on the Facebook page. One entry per person, multiple comments will not increase odds of winning. Winner will be contacted in order to get mailing info. This entry was posted in Contests, Dart Blasters and tagged 2019, adventure force, blaster, blaster hub, Contest, xshot on January 20, 2019 by BuffdaddyNerf. Drone Slayers, Nerf Leaks, and More! Drone Slayer Updates!